Guijarro, D.; Lavin, V.; Raghavan, V.
We prove the following results. Any Boolean function of O(log n) relevant variables can be exactly learned with a set of non-adaptive membership queries alone and a minimum sized decision tree representation of the function constructed, in polynomial time. In contrast, such a function cannot be exactly learned with equivalence queries alone using general decision trees and other representation classes as hypotheses. Our results imply others which may be of independent interest. We show that truth-table minimization of decision trees can be done in polynomial time, complementing the well-known result of Masek that truth-table minimization of DNF formulas is NP-hard. The proofs of our negative results show that general decision trees and related representations are not learnable in polynomial time using equivalence queries alone, confirming a folklore theorem. Guijarro Guillem, David; Lanvín, Víctor; Raghavan, Vijay. 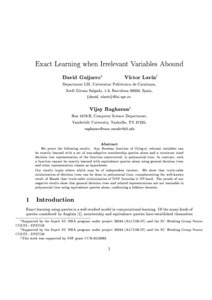 "Exact learning when irrelevant variables abound". 1998.